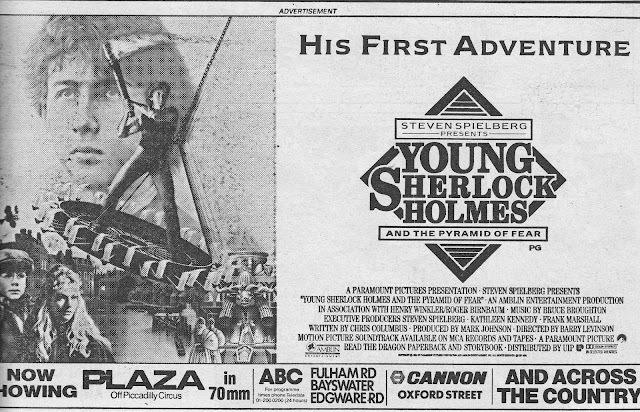 This is a half-page print ad for Spielberg's YOUNG SHERLOCK HOLMES from EAGLE cover-dated 22 March 1986. This film made zero impression on me (and presumably a lot of other folk too which would explain why the planned franchise stalled with this first entry) at the time although I have seen it many years later and I found it perfectly passable entertainment, albeit tinged with the Spielberg family-fare 'house style'. The one much discussed element at the time - and a good hook for a puff-piece on the flick - was the early use of CGI in one sequence. I remember one of the kids shows (BLUE PETER possibly) doing a behind-the-scenes piece about the sequence. I think the "Pyramid of fear" subtitle was a belated addition - possibly only to the international release - in an attempt to evoke the Indiana Jones vibe after the film tanked stateside.